Okra can be a tricky vegetable to handle if you are cooking it for the first time. The slime inside the pods of okra (bhindi) can make it into a gloopy mass of green if cooked wrongly. But the mucilage found in okra is highly recommended if you want to tone up the gut and cleanse it naturally. Along with the mucilage, the fiber content in okra is a good prebiotic. But what to do to not make okra slimy while cooking? 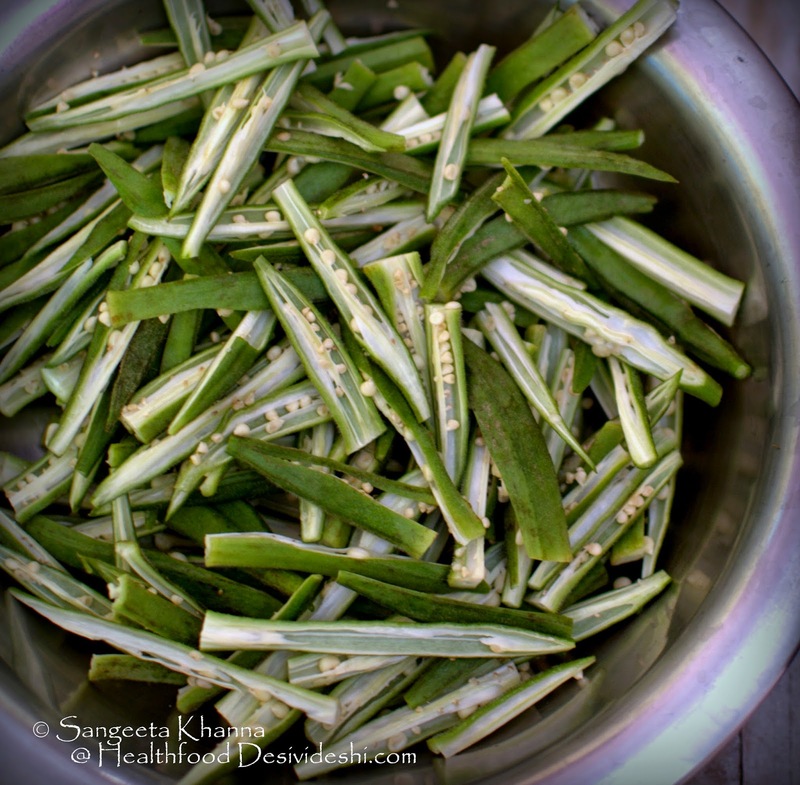 The first thing that everyone recommends is to pat dry the okra after rinsing well, and rinse it before chopping them. Once the surface is dry, chop them as required and cook uncovered, do not stir too much while making stir fried okra. Once you take these precautions, the okra wont get slimy even if you add water to make a gravy with okra. Believe me, this yogurt based gravy with okra is not slimy at all. But if you don't feel confident to cook okra with gravy, cook dry stir fries with it. We love a dry okra with mustrad seasoning, Okra and baby onions stir fry and a very simple ghee fried peppery okra. Apart from these I love steaming or lightly stir frying whole okra with minimal spices like these mustard okra and schezuan pepper okra. 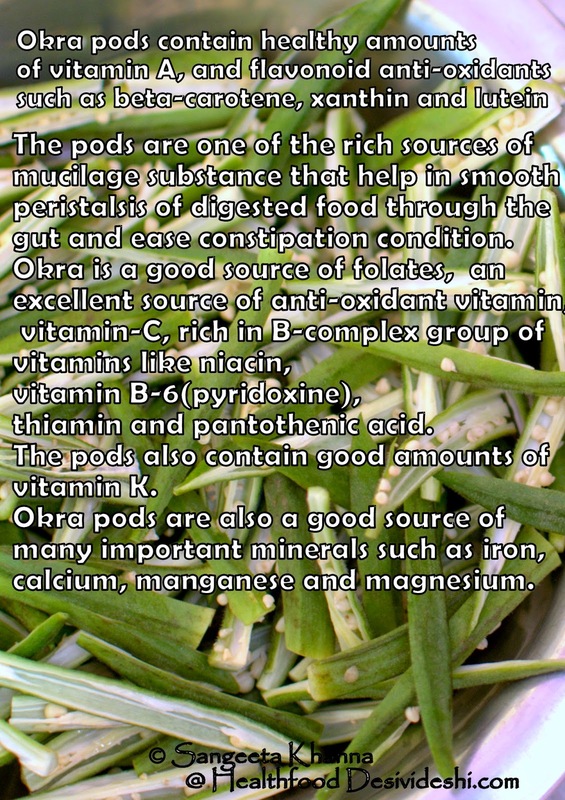 One precaution while buying okra is to choose the tender pods only. The mature pods are too fibrous and even the seeds get too hard to chew. 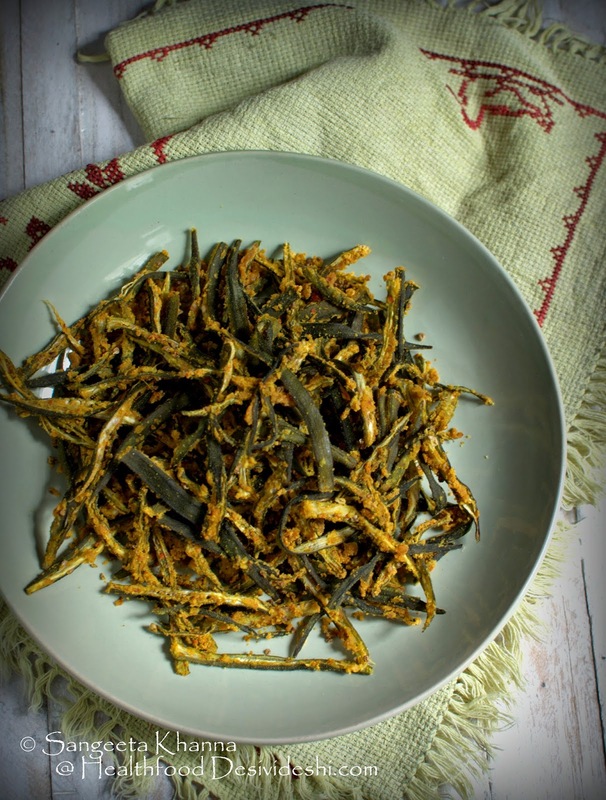 This recipe of baked okra chips will be suitable for appetisers along with a green chutney or a cheese or mayo dip but you would love it with a simple Indian daal and rice meal or with a simple khichdi. Remove the stalk and slit the okra pods lengthwise into 4 pieces. 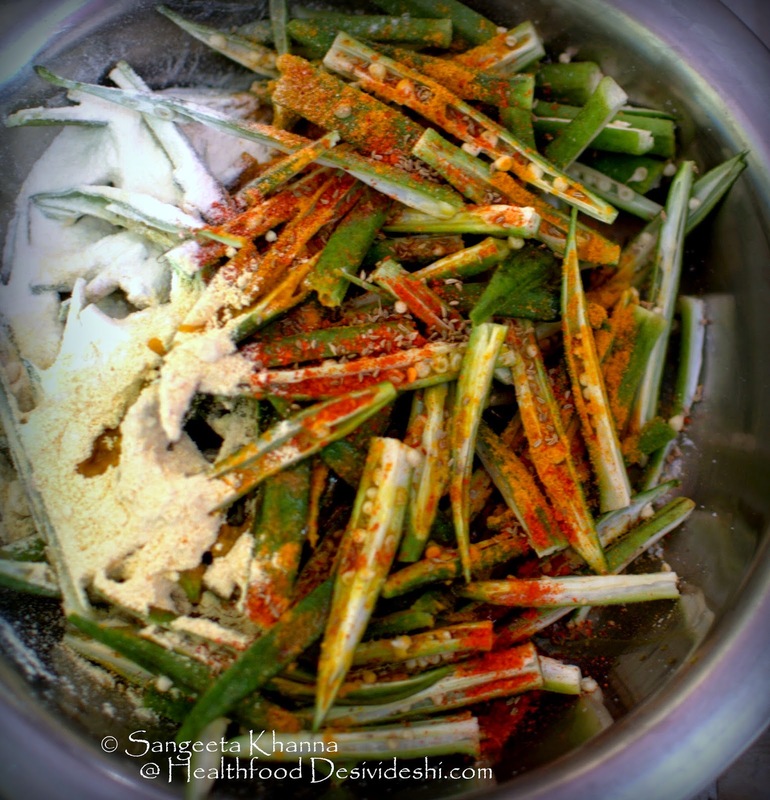 Sprinkle all the dry powders and drizzle the oil over the sliced okra. And massage everything well into the okra slices. Do not worry if the powders don't stick to the okra as it will eventually season the okra well and some bits of the seasoning stuck to okra will make it nice. spread this mixture over a baking tray lined with foil or silpat. And bake at 160 C for about 30 minutes. 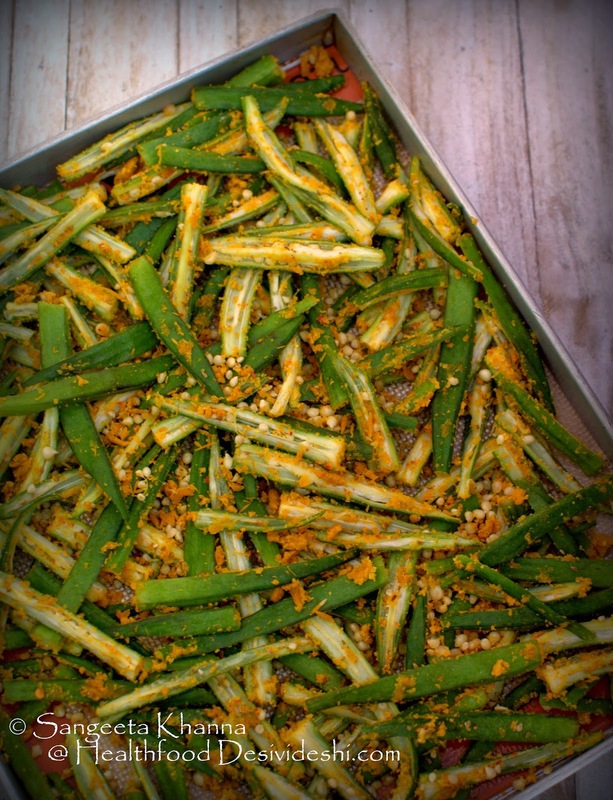 Take out the tray, mix well and bake again at 180C for 10 minutes or till the okra gets crisp. Serve hot or at room temperature. It tastes great with a nice hung curd dip, mayo dip or a cheesy dip with a sprinkling of mustard. And you know it makes a very good accompaniment to khichdi meals too. I love khichdis and I love having something crisp and tangy with my multi grain khichdi. Some raita with my khichdi and okra crisps would be even more fun. You could call it kurkuri bhindi if you wish. 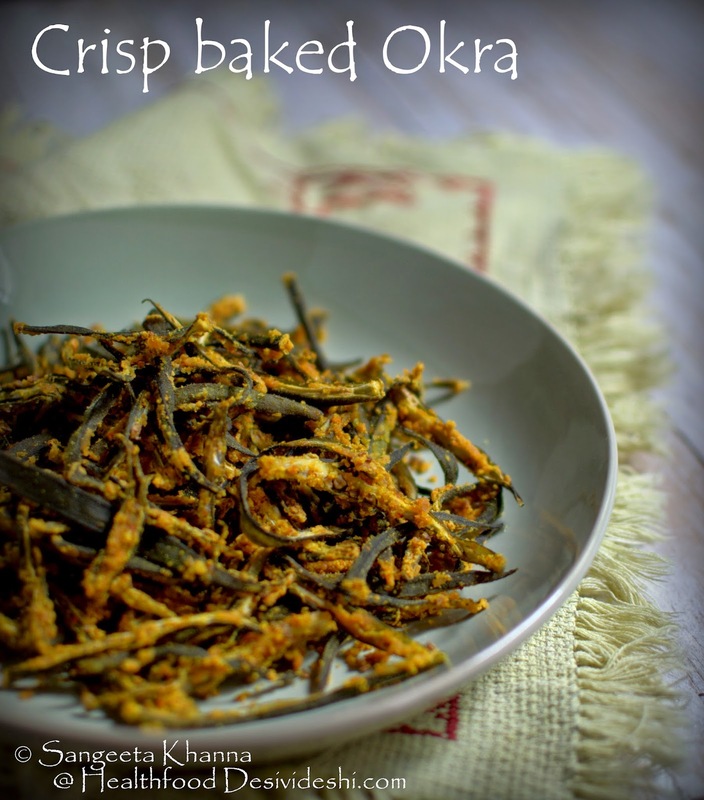 Reading the title I was wondering if it was a deep fried preparation and knowing that you do not generally deep fry dishes,I went ahead curiously ans was pleasantly surprised with the baking treatment you gave to Okra. Loved the recipe. Have to try it. hey Sangeeta, you called it baked Okra but my mind only registered kurkuri bhindi and that's why the earlier comment. Tried this recipe wow was delicious, thanks for sharing this healthier version. Glad you like baked version of kurkuri bhindi :-) Thank you for the feedback.